This voyage to Nationals Park will be a new experience also, because I'm supposed to take the metro to the event. If you know me, or keep up with this blog, you know that I'm less than lukewarm when it comes to public transportation. We shall see. 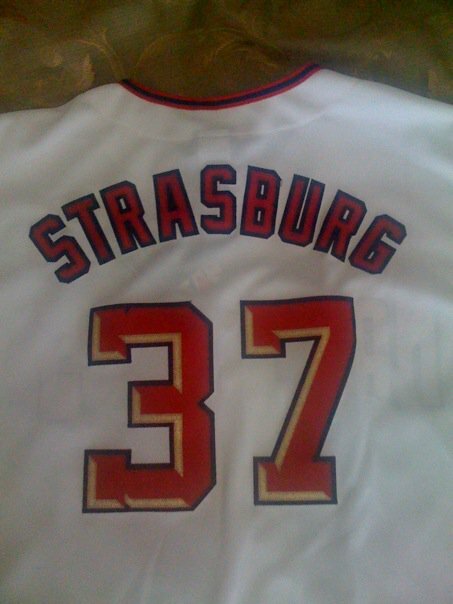 There's a lot of hype around when Strasburg throws, and this game is no exception. This afternoon is Strasburg's last change to make a "pitch" as to why he deserves to be a part of the 2010 MLB All-Star festivities. According to the Mark Newman's article, "A 48-hour poll on MLB.com last week revealed that roughly 65 percent of fans say the rookie pitching sensation does not belong in the event, at least not yet. However, Strasburg is arguably the top viewer magnet in the game right now, his appeal extending beyond Nationals fans. The decision belongs exclusively to Manuel and MLB." Looks like Charlie Manuel and MLB have something serious to think about. In honor on Independence Day's impending arrival, Strasburg and Washington Nationals fans can let themselves be heard immediately following the announcement of the All-Star rosters. According to Newman's article (i.e. cited above), "Fans will vote to select the final player for each league's 34-man roster, through the 2010 All-Star Game MLB.com Final Vote Sponsored by Sprint, now in its sixth year. Fans can choose from a list of five players from each league from July 4-8, and the winners will be announced after the voting concludes on July 10."